‘Having long suspected that the church of Canisbay … was built on a green mound covering the ruins of a broch, I visited the churchyard in company with the Rev. Mr Macpherson, minister of the parish, and found that one side of the mound on which the church is built showed unequivocal traces of the refuse-heap usually attached to a broch. Mingled with the human remains of recently opened graves was a large proportion of more ancient remains of a totally different character, consisting of the bones of the ox, the sheep, deer, horse, swine, and seal (? ), the bones of birds and fish, and the shells of common shore shell-fish–principally buckies and limpets. The long bones of the animals were broken and split, and often half charred ; the deer horns cut, sawn, and sometimes split. Pestles or pounding stones occurred here and there ; and, on questioning the grave-digger, we also learned that he had been in the habit of exposing dry-built walling, and at certain places of digging up ashes, deer horns, shells, bones of what he called whales, and which probably were so, and occasionally quern stones. A very good specimen of a pot quern, which he unearthed subsequently to my visit, is now preserved at the manse’ (Anderson 1890, 133). Finds from the graveyard, including red deer antler and hammerstones, are now in the NMS (PSAS 1873, 248; SMR nos. ND37SW5 and 32, ND 3434 7285). This association, along with the generally accepted dedication of the church to St. Drostan, would suggest that Canisbay is an early medieval foundation (Scott alone says that the church is dedicated to St. Anne (FES, Vol. VII, 116)). According to Beaton (1909, 48), the original chapel lay to the north of the present site and was known as ‘Kirk by the Sea’. He states that the site of the chapel is discernible, but it seems more probable that he is refering to building footings between the church and the Papel rock, which are said to be an Old Distillery on the OS First edition map (SMR no. ND37SW18, ND 3428 7297). The distillery was founded c. 1826, as a means of providing work for the sons and tenants of George Sutherland, the owner of the farm of West Canisbay (Houston 1996b, 345). Having spent £800 on constructing a malting kiln, a corn kiln and the distilling plant, he lamented in a letter to one of his sons that he had never got a single dram from it (ibid.). All that is left of the distillery is a length of walling, red roof tiles and some scattered bricks (ibid.). Associated with these buildings is a small quarry (George Watson, pers. comm. ), while a well is also noted on the OS First edition. Lyrequoy, the name of another well, just to the north-west, means ‘the clay fold’ (Mowat 1933, 178). On the modern map, the area of the distillery is called Slayel, (suggested to be from the Norse sly áll, a narrow inlet often filled with seaweed, ibid. ).31 Other names along the shore, such as Scaabank (now Sea Bank), a small sandy bottomed channel, incorporating the ON skaggi, a low ness, and bakki, a bank (ibid. ), seem to be topographically descriptive. This area was known as Gills, understood to be a corruption of Kills, but more likely to be from ON gill = ravine (Beaton 1909, 48). The church tower of Canisbay, as with that at Dunnet, is probably of pre-Reformation date. Traditionally, the present church is meant to have been built on top of a round tower, thought to have been separate from the contemporary church and perhaps the burial vault of the Sinclairs of Mey (Houston 1996a, 318); it is possible that this reflects the presence of the broch rather than a round tower as at Egilsay church, Orkney. The pair of carved pillars, now against the north wall of the Mey aisle, may have originally formed part of this vault (ibid.). The church's two transepts appear to date from the seventeenth century, while the main body of the building dates to the early eighteenth century and was further altered in the nineteenth century. The gravestones, including those of the de Groat family, date back to the sixteenth century. The church was assigned as a prebend of Dornoch cathedral by Bishop Gilbert in his constitution of the chapter in 1224 x 45 (OSR, no.9; Cowan 1967, 26). Both the parsonage and the vicarage continued to support a prebendary, while the cure was served by a vicar pensioner (ibid.). The parish was ‘at one time’ divided into districts. Mey included St. John’s Point at the north-west boundary of the bay where there is a chapel located within a prehistoric fort. When it was excavated in 1919 a cross-slab was found which had been re-used as a side-slab in a stone-lined grave which may be tenth century or earlier (Fisher, 2002, 45). 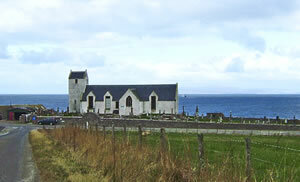 Other chapel sites are St. Maddan’s at Freswick, St. Tustan’s (probably Drostan) at Brabster, St. Mary’s at Duncansby (Jolly 1840, 25) and a ‘chapel and burying-place’ at John of Groat’s House (Craven, l886, 204). Within this scheme, the parish church served only the adjacent district (ibid.). A slightly earlier description of the parish adds to this the two chapels on the island of Stroma ‘called commonly the Kirk of Stava and the Kirk of Old Skoil’ (Anon. nd., 156), while St. Irchard’s Chappell is mentioned in the Fasti Ecclesiae Scoticanae as a place of pilgrimage in post-Reformation times (Vol. VII, 116; Vol. VIII, 676). There is also the possible hermitage at Strubster, on the boundary of Canisbay, Wick and Bower parishes (Anon. nd., 156; see below). Ordnance Survey, 1873 (1877). First edition. 1:2,500. Sheet II.16. Ordnance Survey, 1905 (1907). Second edition. 1:2,500. Sheet II.16. Ordnance Survey, 1981. 1:10,000 series. Sheet ND37SW. 32The session records, dating back to 1652, are the second oldest in Scotland and may well contain a wealth of evidence for the survival of superstitions and traditional customs.